Located in the old Mono Lake schoolhouse at the south end of Hess County Park in Lee Vining, the Mono Basin History Museum displays artifacts, furniture, maps, equipment, and photographs that chronicle the cultural history of the Mono Basin. 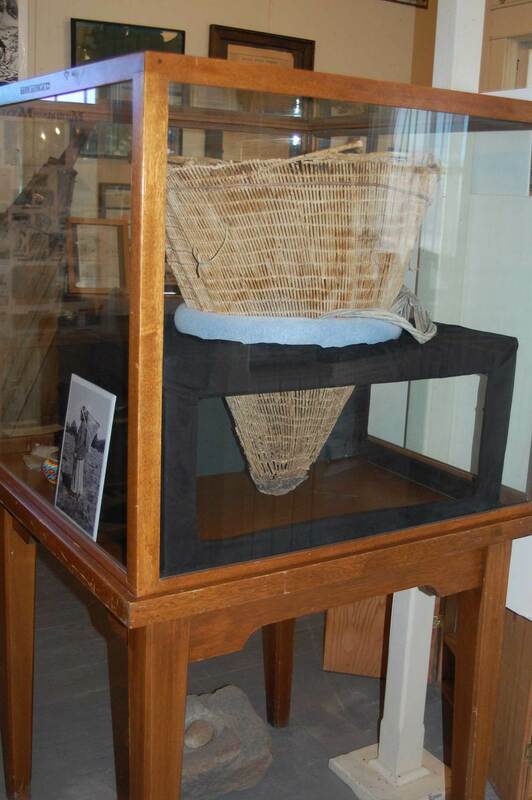 Inside the museum, displays tell the history of the local Kutzedikaa Paiutes, regional gold mining, Mono Basin homesteads and ranches, schools, resorts, and the town of Lee Vining. Outdoor exhibits feature Nellie Bly O'Bryan's world famous Upside Down House, and farming and mining equipment. The Mono Basin Historical Society (MBHS) is a non-profit citizen’s group dedicated to the preservation, protection, and interpretation of the Kutzadikaa Paiute, pioneer, and mining heritage of the Mono Basin. We meet the first Monday of each month with a potluck dinner and free programs about regional history. Check the "New Events" tab on this page to see what is coming up. Officers: President David Carle, Vice-President Susan Desbaillets, Secretary Ellen and Duncan King, Treasurer Chris Lizza, Historian Linda LaPierre. Museum Manager and Membership Coodinator: John Warneke. Use the "contact us" link to reach us via this webpage. Historical Society meetings are held the first Monday of each month (except September and January), usually at the Lee Vining Community Center. Potluck dinner and a short business meeting are always followed by special programs presented by historians or authors. Click on “New Events” in the page header to read about our upcoming presentation. Read our blog about local history topics by clicking on that link in the header. Want to know more about our Upside Down House? Visit our Outdoor Exhibits page! In 2009, Huell Howser's California Gold television series shown on PBS channels featured the Upside-Down House in a show titled “Places I've Wanted to Go.” Watch this 2 minute edited version!